Even if are not into ships, the Denny Tank Museum in Dumbarton will keep you hooked to the history of nautical engineering. The shipping and shipbuilding history is made alive in this museum. This Maritime museum is open from Monday to Saturday from 10 am to 4 pm. You will get to know how William Denny and Brothers’ initiative created a stir in the shipbuilding history from the 1800s to 1963s. World’s first commercial ship model and its carriage running is the most interesting part of the tour. You can visit William Denny’s drawing office and get to know how to build and design your own ship. Various photographs, historical objects, and ship models are displayed in the Propeller Shop. You can also try out smoothing and carving a real wax hull model or test different hull designs in the mini experiment tank with its own wave making the machine. Apart from that, the Corner Café is there serving the finest of snacks and meal. Personalize your visit to the city by chalking out a plan using Dumbarton trip planner. You won't miss your home when in Dumbarton, hotels in Dumbarton like Normandy Hotel, The Watermill Hotel and Erskine Bridge Hotel offer some of the best places to stay in the city. Choose from variety of exclusive Dumbarton vacation packages for your next visit or create own own. Check out the various options for how to reach Dumbarton and finish off your vacation package by booking the ideal transfer. Love this? Explore the entire list of places to visit in Dumbarton before you plan your trip. Fancy a good night's sleep after a tiring day? Check out where to stay in Dumbarton and book an accommodation of your choice. How popular is Denny Tank Museum? People normally club together Auchentoshan Distillery and Levengrove Park while planning their visit to Denny Tank Museum. Very interesting museum with top notch, knowledgeable staff. Would highly recommend to anyone with an interest in machines, ships and boats, engineering, drafting, architecture, or design. There are also interactive displays for the kids. Worth a visit! I visited this place last as i love boats. Got a nice cafe. One of the staff showed me around. Very interesting. I learned a lot. Bought a model lighthouse to take home. Recommend. A unique piece of maritime history. 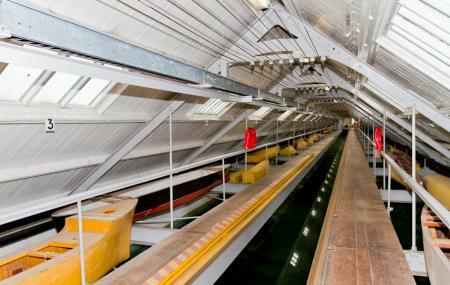 A working hydrodynamic testing tank and the story behind shipbuilding in Dumbarton. Great staff and food, an absolute for full Scottish breakfast.